Baylor University, a private Christian university, provides a vibrant campus community by blending nationally ranked interdisciplinary research with an international reputation for educational excellence. The Institute for Air Science’s mission is to educate a new generation of dedicated aviation professionals, advance our understanding of the aerospace environment, and promote the academic and spiritual growth of our students. The Bachelor of Science in Aviation Sciences (B.S.A.) is a four-year undergraduate program with multiple options so you can serve on the ground or take to the skies. While at Baylor, you will have exposure to all the energizing student life activities you’d expect from a Big 12 University, with a faith-based community that fosters personal and professional growth. 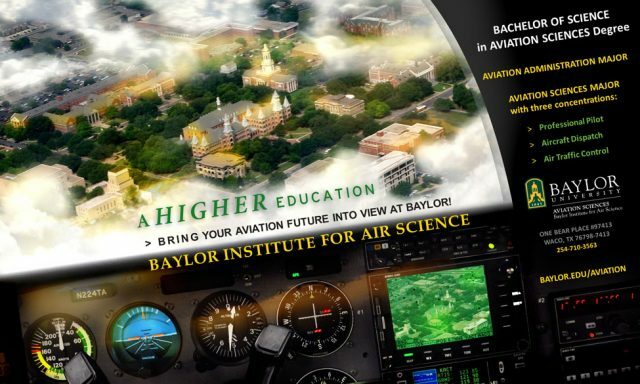 Baylor prepares you for a full throttle career in the aeronautics industry. In partnership with Baylor's Hankamer School of Business, the Aviation Administration major is for students who wish to pursue a career on the business side of the industry. You will take a variety of courses in Aviation Science, Business, and Management, merging the individual concepts into a strong foundation that prepares you for key operational and executive positions within the aviation community. This major is offered for those aviation enthusiasts with the dream of never working a day in their lives because their career is simply what they love to do. There are three possible concentrations under the Aviation Sciences major and while the majority of the required courses are the same for everyone, other courses are concentration-specific and define the specialty. These programs are offered in cooperation with our partner school, Texas State Technical College (TSTC), also located in Waco, TX. Our Professional Pilot concentration propels you into the flight crew atmosphere as you attend classes thousands of feet off the ground! You will earn Commercial Pilot level qualifications, with Instrument and Multi-Engine ratings, and a Certified Flight Instructor (CFI) certificate by the time you graduate. Graduates may be eligible for a 500-hour reduction in the amount of flight hours required for the Restricted Air Transport Pilot license (required to fly for the airlines). Qualified students in the program may also enjoy the perks of an Envoy Pilot Pipeline Program that could lead to employment at American Airlines in as little as 2 years. The Aircraft Dispatch concentration is for those who want to play a vital role in daily aviation operations without ever flying a plane. Often called a “pilot on the ground”, dispatchers are responsible for planning every detail of a flight, from weather and routes, to fuel consumption and load distribution; ensuring safe and efficient functionality within the aviation industry. Dispatch students will complete all of the necessary requirements to take the FAA Aircraft Dispatch Written Exam and the Oral Practical Exam. In the Air Traffic Control concentration, you will learn to control aircraft from the moment they push off the gate to the second they successfully reach their final destination. You will train on state-of-the-art equipment, learning all of the necessary skills to prepare you for the rewarding yet high-stakes career as an FAA Air Traffic Controller. If your heart is committed to a major in another academic field, but you are still drawn to aviation, you can enroll in our Aviation Sciences Secondary Major! It requires fewer hours than the major, and you can still obtain your Private Pilot's license. Requiring 18 hours of aviation courses, the minor creates an extremely versatile education paired with your selected major of choice. It is available for students interested in learning more about the dynamic aviation industry but requires no flight training.